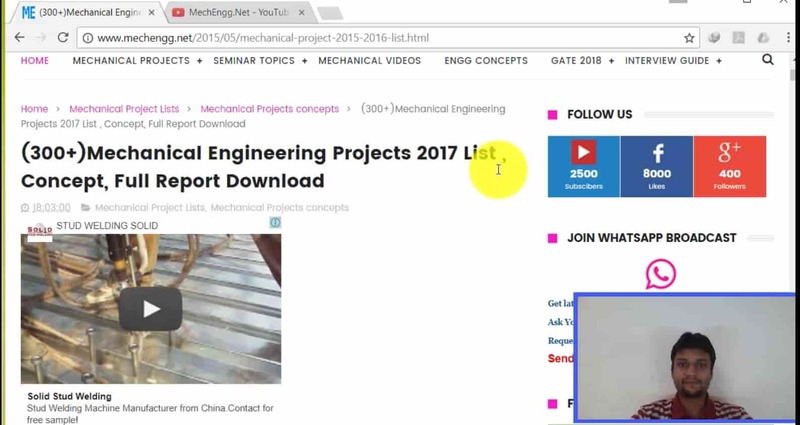 Many of you may be confuse about project selection because lots of topics are available on internet as well as your seniors might have told you some guidelines. Why this Project work ? 1) You can increase your overall percentage by scoring 90 to 95% marks through a good project. 2) An industry-oriented project can add extra weightage to your resume and help you get a good job in the core mechanical industry.A technically good project can give you an added advantage if you are planning for higher studies in US, UK, Germany etc.Hence, make your final-year project valuable even if it takes a little more time and effort. Aerospace, Automobile, Marine, HVAC, Oil and Gas, Industrial, Turbo-machines, Machine-tools, Appliances etc. This type of projects need good lab-facilities and hi-tech instruments for measuring your experimental set-up accurately. Only IITs and IISc have such facilities. Students from Tier II and private colleges try their best but mostly end-up in cooking-up the results or change the project at the last moment due to non-availability of the above facilities.Also it involves more time and cost for setting up the project for those students who are already tightly scheduled with final-exams or campus interviews.This type is feasible for those who don’t have such constraints. CAE Projects – Stress analysis, dynamic analysis etc. of aero, auto or mechanical systems can be done through these projects. New design, Improving performance, optimization can be accomplished. FEM based software like ANSYS, NASTRAN, RADIOSS, HYPERMESH etc. can be used. Interviewers give more weightage for good projects. 1) Firstly Choose type of project and interested area i.e. Production based project, automobile projects, design based project, CAD/CAM/CIM Projects etc. 3) Do search For related Journal papers available about your topic. 4) By referring Journal And books design your project model ,finalize the dimesnsions. thanks for sharing this blog with us. I really need it. Now no need for further search for me. Let me if you have any more such information. next article awaited. I read your all topics very well to all of them…. You have been great with all your published works here – I hope you keep it up!